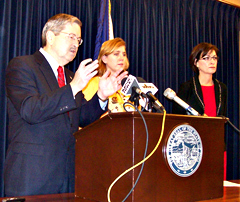 Governor Branstad released his proposal today for changing the state-funded preschool program. Governor Branstad proposes a $3,000 state scholarship for Iowa parents who are not what he considers “affluent” to help cover a year’s worth of preschool tuition for their 4-year-old children. Branstad’s definition of affluent: a family of four that earns over $67,000 a year. Those who earn less than 300 percent of the poverty rate would qualify for the scholarship, and they’d choose whether their child goes to the public preschool programs which sprang up when the state began covering all the costs, or private preschools. Jason Glass, the new director of the Iowa Department of Education, says tough times require tough choices. “The governor’s plan is to hang onto as much of a quality early childhood education system as we can, while targeting services to children who stand to benefit the most,” Glass says. The state had been providing $3,500 for each 4-year-old enrolled in preschool, but a Branstad aid says some superintendents reported they didn’t need that much to hire a certified teacher and provide 20 hours of preschool per week. All the parents who’d qualify for the $3,000 preschool scholarship would be required to pay for preschool, too, on a sliding scale matching their income. The co-pays would start a $3 a month, with a maximum co-pay of $133 a month. Representative Cecil Dolecheck, a Republican from Mount Ayr, is co-chair of the budget panel that drafts state education spending plans. He points to Branstad’s idea of getting more private donations to help finance preschool for low-income children. Senator Brian Schoenjahn, a Democrat from Arlington, is the other co-chair of the panel that drafts state education spending plans. He says Branstad’s proposal would make it more difficult for middle-class families to find and pay for a quality preschool program for their kids.